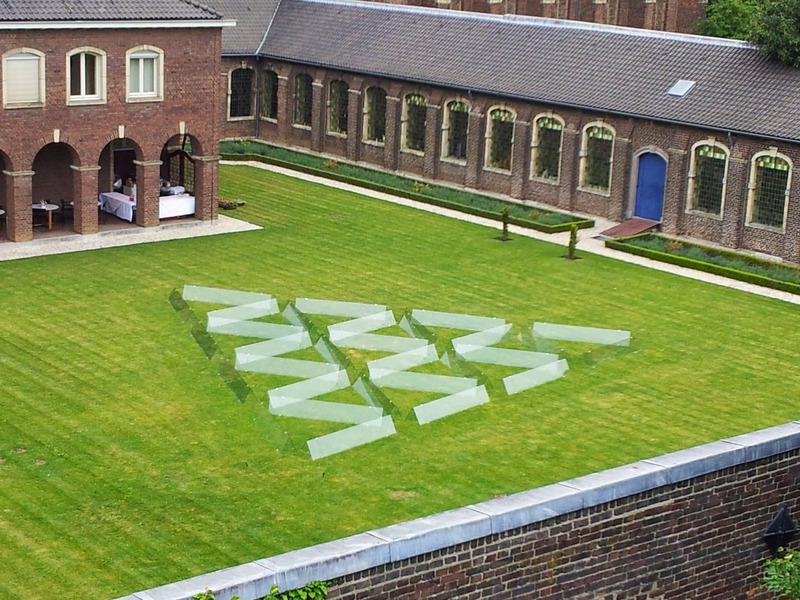 tuin van de kruisgangen van het Karthuizer-klooster in Roermond. met de architect Olga Doreva vervaardigde, op uitnodiging van het Water Tower Art Fest 2012,in Serdica Basement (ROCA-gebouw), in het centrum van Soﬁa Bulgarije. Galerie High Culture organiseren samen deze bijzondere tweejaarlijkse tentoonstelling. 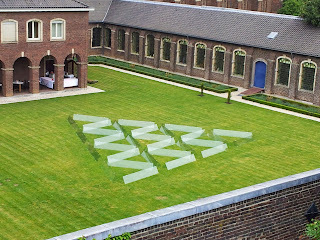 Jan Doms designed and constructed ʻSerdica Triangleʼ as part of the 9th edition of Biennial Roermond in the garden of the cloisters of the Carthusian Monastery Roermond. This sculpture made out of glass derives its triangle shape from the project which he created this summer in collaboration with architect Olga Doreva, invited by the Water Tower Art Fest 2012, in Serdica Basement (ROCA building), in the city center of Soﬁa Bulgaria. In this annex of the National History Museum are the remains of the ancient Roman city on which nowadays Soﬁa is built. It is a part of the town-wall and a triangle fortiﬁcation. A shape which you very rarely ﬁnd in Roman architecture and city planning. Aspa Petrov created a short but striking animation ﬁlm about the building process of this remarkable archi-installation of glass. The ﬁlm is based on the images taken by Jan Doms and Olga Doreva. We invite you kindly to join us at the ﬁrst introduction of the ﬁlm animation ʻRegained Historyʼ in the cloisters of this beautiful Monastery. You can also visit the exhibition. Mariska Dirkx Gallery, Young Culture Gallery and High Culture Gallery are the organizers of this extraordinary biennial.